You can edit or delete a charge adjustment that has been posted to a patient's ledger. 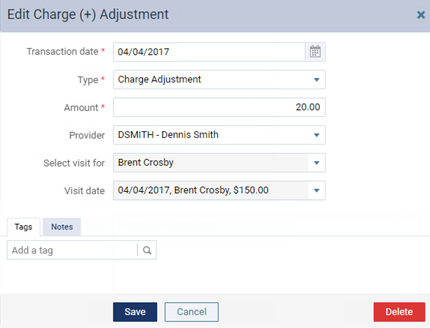 On a patient's Ledger page, select a charge adjustment. The Edit Charge (+) Adjustment dialog box appears. Change the adjustment details, such as the type, provider, and amount, as needed. Date - The date of service. Leave the current date entered, or click (or tap) in the field to select a different date. However, you cannot backdate a transaction to a date that would cause it to become locked based on your organization's transaction lock setting. Type - The adjustment type, such as Charge Adjustment or Patient Refund. Amount (Adjustment) - The amount of the adjustment. Provider - The provider to associate with this adjustment. Note - Any relevant notes regarding the adjustment. To delete the adjustment, click (or tap) Delete and then OK on the confirmation message that appears. Ignore step 3. If the adjustment is associated with an insurance payment, to edit the adjustment, click (or tap) the Insurance Payment link that appears in the upper-left corner of the dialog box. Ignore step 3.